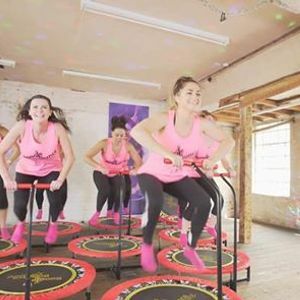 Put simply – bouncing on a mini trampoline is unlike regular trampolining; the aim isn’t to bounce high or perform gymnastic tricks, but to perform a series of small, controlled movements. Boogie Bounce is dancing with intervals of jumping, bouncing, frogging and stomping, to name but a few moves, performed to music and a set programme. The mat of the mini trampoline is used as a resistance tool which makes the whole programme two to three times more effective than a normal everyday aerobics class. Anyone and everyone can do this at their own pace whilst gaining the the impressive health results that are normally associated with high impact aerobic classes, without even realising it! 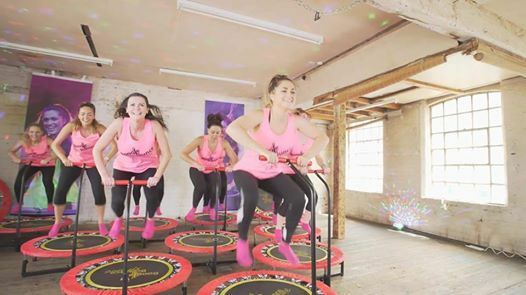 Boogie Bounce uses High Intensity Interval Training (H.I.I.T) techniques to maximise the most effective fat burning process in the cardio section, whilst using the pliable surface of the mat to perform a range of core stability exercises, thus engaging more of the deep core muscles. The programmes have been a hit since 1996 with countless success stories from regular attendees amazed at the ‘all over’ health and fitness results achieved. There are types of classes to suit all ages and abilities. There is Boogie Bounce Xtreme, Boogie Bounce Beginners, Boogie Bounce Kids, Boogie Bounce Birthday Parties, Boogie Bounce Hen Parties, and many more.